The International Council of Ophthalmology ( ICO ) Course for Ophthalmic Educators mentioned an available Australian grading program for diabetic retinopathy www.drgrading.iehu.unimelb.edu.au/cera/index.asp. You do have to register which is easy and quick. This is a 1.5 hour self-directe d course designed to provide training in grading diabetic retinopathy. I would recommend to all ophthalmologists and especially to those performing laser surgery for diabetic retinopathy in developed and developing countries. With fungal corneal ulcers you must look closely at the limbus as fungus can readily spread into the sclera unlike bacteria. Voriconazole can be injected directly into the corneal stroma. If you are doing a intracameral or intrastromal injection, you should also wash out any hypopyon. Debulking the stromal infiltrate is often important. There is a lot happening with new efforts / commitments being made to reduce worldwide blindness especially in the developing world. I will make some quick references / points but anyone with a keen interest should visit some of the IAPB / WHO web sites. The IAPB “WHO Facts” on blindness and visual impairment: global facts were taken from a global data document on Visual Impairment 2010 which was published by WHO, Prevention of Blindness and Deafness ( PBD ). Top causes of blindness are : cataract, glaucoma, and age - related macular degeneration. Blindness secondary to diabetes is increasing. The # of people visually impaired from infectious diseases has greatly reduced in the last 20 years.See, I told you it was getting better. Currently the best guess ( WHO / IAPB ) is 285 million visually impaired of whom 39 million are blind ( VA worst than 3/60 or a corresponding visual field loss to less than 10 degrees in the better eye ). Poorer populations are more affected by visually impairment including blindness. This is true in the States as well as developing countries. In May 2013 the 66 th World Health Assembly unanimously approved the Global Action Plan for the Prevention of Avoidable Blindness and Visual Impairment 2014-2019 —Towards Universal Eye Health < www.who.int/blindness/actionplan>. The Global Action Plan < www.iapb.org/advocacy/who-action-plan/focus-challenges> ( GAP ) is a commitment endorsed by all WHO Member States to improve eye health for everyone ( Universal Eye Health ) over the next 5 years. GAP is now the most important strategic document in eye health. It builds upon and replaces the previous Vision 2020 < www.iapb.org/vision-2020 > and the 2009-2013 Action Plan. It represents a significant step forward towards achieving ‘ universal access ‘ to eye health. Its goal is to reduce avoidable visual impairment as a global public health problem and to secure access to rehabilitation services for the visually impaired. The purpose of the action plan is to achieve this goal by improving access to comprehensive eye care services which are integrated into other health services. To change the subject, I would like to retract my previous suggestion of using K-Y Jelly for gonioscopy / laser cases. In some patients you can develop a superficial epithelial keratopathy with the K-Y gel. However any thick ( viscous ) artificial tears such as Genteal Tears will work with a three mirror lens, etc. If anyone is interested in spending a month in northern Ghana in 2015 covering for a ex-pat ophthalmologist, please let me know. You would be in charge of a busy eye clinic where there is a lot of serious eye problems. You could operate one or twodays weekly if you wanted or none at all. There is a safe air - conditioned house not too far from the eye clinic where you could stay without cost. You could probably go out on outreach if you wanted. Again, if anyone is interested or wants more information please let me know. There is no Ebola in Ghana unlike the USA. What’s really important is not how much money you accumulate but how much good you do. Perhaps some of our ophthalmic commercial leaders have forgotten that. 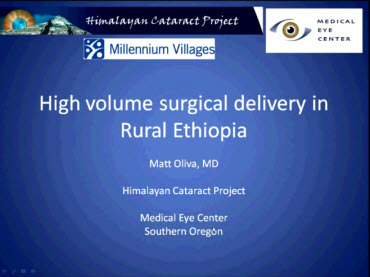 Recently an ophthalmic USA friend told me that he felt what was partially driving the multifocal IOL market was the potential for making more money with each cataract operation. Lastly would like to wish everyone a Happy Hanukkah, Merry Christmas, and a Happy New Year.